BMW was looking to drive awareness for the MINI NEXT program; an inventory of high quality certified used-vehicles. We created the “Your next one’s on us” promotion, where MINI branded coffee sleeves were distributed at high-traffic coffee shops on and around campus. 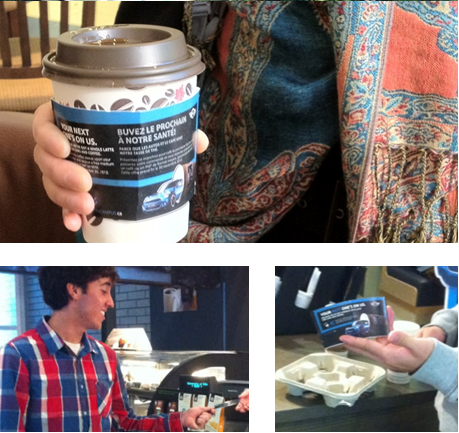 These sleeves not only offered students a surprise and delight experience – a free coffee on MINI – but also drove awareness of the MINI NEXT program. To boost program awareness and student intrigue, each participating coffee retailer was also equipped with a high-impact (3 ft x 6 ft ) MINI in-store standee. Buzz Agents were also leveraged to generate guerilla postings on their personal Facebook and Twitter to amplify program reach. 267,500 media impressions were generated over a 4 week period. We also delivered a successful data mining effort to collect contact information from interested student buyers.